Learn more of the Island Ladies’ culture and traditions with your Filipino woman; join one of our singles’ tours to the Philippines! As diverse as the thousands of islands comprising the archipelago of the Philippines, the country has become a kaleidoscope of culture and tradition. The contemporary Philippines is a product of the dramatic developments that took place throughout the years. The culture of the Philippines is a combination of the East and West cultures. Its traditional culture is heavily influenced by its Austronesian origin. The long years of colonial period in the Philippines’ history under the rule of the Spanish, Chinese, Japanese, and Americans shaped its cultural landscape. Up to this day, Filipino people continue to embrace diversity and changes. These, and the major religions in the country such as Christianity and Islam, have immensely defined the cultural identity of the Philippines. The most definitive Filipino gesture of showing respect to elders is through the so-called pagmamano. It is an honoring gesture, which involves a youngster asking for the hand of an elderly person and then kissing or placing his or her forehead on the back of the hand; a way of requesting a blessing from the elder. This shows how they hold high regard to the elders and how respectful they are to one another. Bayanihan is a Filipino custom derived from its root word bayan, which literally means nation, town or community. The term means "being in a bayan", which refers to the spirit of communal unity, work, and cooperation to achieve a common goal. The Bayanihan concept is traced back to the country's tradition, which is observed in rural areas, wherein the people in the immediate community (especially the men) lend a hand to the family who is moving to a new place. This does not only depict relocation of belongings, but most importantly the transfer of the family's house (called Bahay Kubo, a traditional Filipino nipa hut). Collective effort of the community can be seen in this as much as unity and camaraderie. 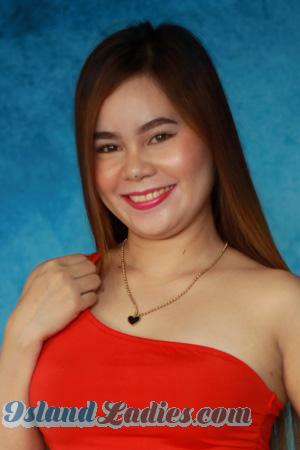 The concept is also applied in Philippine marriage culture, wherein relatives of both sides help one another for the success of the ceremony. Jeepneys are buses and the most popular means of public transportation running in most cities and some provinces. 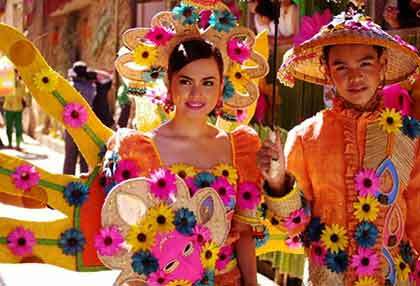 The design is Filipinized with colorful decorations, reflecting Philippine art. A crowd of passengers sit in very close proximity to each other. Favorably, the term sounds like the combination of the words "jeep" and "knee". However, jeepneys were originally made from U.S. military jeeps left over from World War II. The timeless jeepneys in the Philippines, equivalent to Thailand and Laos’ songthaew, symbolize humbleness and how laid-back life is in the country. Fiesta is an ancient tradition inspired by the many Spanish religious practices. Most fiestas are celebrated to honor patron saints and to commemorate major events in the life of Jesus Christ and his mother. However, there are many types of fiestas --- it can be religious, national or seasonal. Even before the coming of the Spaniards, Filipinos practiced animism, or the worship of spirits, which involved performing ceremonies or rituals. Different festivals are happening throughout the year and across different regions in the country, serving different purposes. 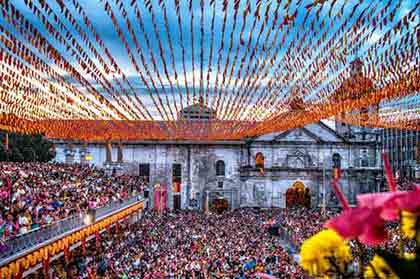 This serves as a platform for Filipinos to express prayers, thanksgiving, and merrymaking. One of the biggest and most anticipated holidays by the Filipinos is Christmas. The country celebrates the world's longest Christmas season, with numerous events all throughout. The Roman Catholic churches in the Philippines celebrate night or dawn masses nine days before Christmas day; they call it "Simbang Gabi or Misa de Gallo". Christmas decors and lights are also set around every corner in public places and homes. Coworkers, peers, and friends organize Christmas parties while children who are taking a break from school do caroling door to door. The importance of the holiday is evident in many other activities, such as gift giving, family reconciliations, and even reunions. The Filipino community is a blend of conservative and liberal society. This is drawn from their humble beginnings and responsible upbringing. Filipinos are one of the happiest people in the world. Despite adversities, they keep a positive outlook in life. This makes them easy-going people and good company to be with. They possess certain attitudes that other nationalities appreciate the most. They are known to be hospitable and friendly, warm-hearted, resilient and optimistic, and faithful to their loved ones. Know more about Filipino women, by signing up on our site for free! In terms of religion, the Philippines’ population is comprised of 85% Christians, 10% Muslims, and the remaining 5% practice other religions like Taoism and Buddhism. Apart from this, a small percentage also practice animistic beliefs in the upland areas, which were practices that survived the Spanish colonial rule for 300 years. Regardless of religion, majority still believe in a common god. They take responsibility for their actions and they believe in karma, wherein every action has a corresponding consequence. Due to this, Filipinos treat others the way they want to be treated as well. Filipinos live their faith in their households. What ties a Filipino family strongly is their religious beliefs. Together, they share common values and it’s typical for families to attend holy mass every week and celebrate religious ceremonies and events together. Not only that, religion also guides parents towards responsible parenting and drives every member towards a religiously righteous life. In any religion, morality is held with due importance. The members of a certain religion follow a set of rules and standards religiously. For Filipinos, they maintain peace and order by thinking, making decisions, and acting according to ethics and norms. Generally, women in the Philippines are norm-abiding --- they value reputation and credibility. Family is the basic unit of society, for it’s where everything starts. Despite already becoming adults and having families of their own, a Filipino never forgets their origin and always considers their immediate relatives. This shows the huge role that familial ties have in the Filipino’s life. A typical Filipino family is either extended or jointed. It consists of parents, children, and other close relatives --- often living in close proximity. The father is acknowledged as the head of the family and has full authority. However, Filipino families aren’t considered merely patriarchal, as studies by sociologists show that it’s egalitarian by nature. This means that each member is equally important and has the same rights and opportunities. The father is generally the provider of the family and is called the pillar of the home. On the other hand, the mother serves as the light of the home. She is responsible for homemaking, nursing the children, preparing meals, managing family finances, and in most cases, while juggling the responsibilities of her career. Each member plays a specific role. Children for instance, are taught to take responsibility for household chores. Thus, the parents teach the eldest to take charge of their siblings, especially when they’re away from home. The eldest helps the mother in taking care of their siblings and is expected to be their role model growing up too. The home is where values are formed, as parents nurture their kids to become responsible individuals. The family has values that are instilled and practiced by each member. Respect, camaraderie, compassion, debt of gratitude, close family ties, and honor are some common family values in the Philippines. If you think about it, your Filipina bride belongs to a family with close ties. She is a product of responsible parenting and her cultural orientation and upbringing makes her a desirable wife. She is expected by her family to live what she was taught and by the values she learned ever since she was a child. If you marry a Filipina, you don't just marry a beautiful wife, but also a beautiful culture and tradition. 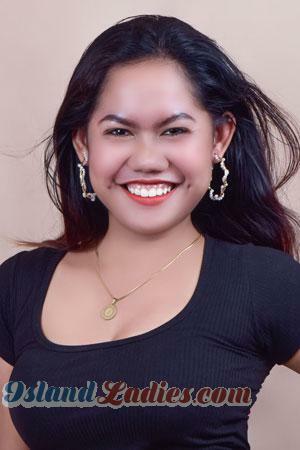 Begin your quest to meet single women in the Philippines, sign up for the best marriage agency in the country today and get the chance to join one of our world-renowned romance tours. Register for free now and experience one of the finest cultures in the world through Island Ladies!